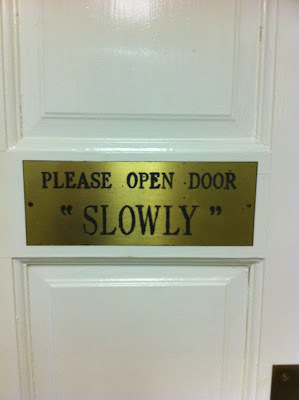 The “Blog” of “Unnecessary” Quotation Marks: do it "slowly"
I guess it's ok if you do it fast but then do some slow motion gestures. Thanks, Clark. Somebody's begging for a broken nose. Maybe it's in Britain where they expanded on their custom where some people name their houses. These people went a step further and named their doors too. WV: reompit =widespread. as in: Hurricane Irene did not produce the kind of 'reompit' damage we were led to expect.